Baseballs rarely stick to chest protectors, but for Cardinals catcher Yadier Molina, that oddity became reality Thursday afternoon in St. Louis on a dropped third strike play, allowing Cubs batter Matt Szczur to reach first base after swinging and missing at a 0-2 curveball from Cardinals pitcher Brett Cecil. Replays indicate nothing extraordinary: the ball didn't wedge itself underneath the chest protector and Molina's uniform shirt, it never hit Szczur nor his bat, and didn't come near HP Umpire Quinn Wolcott: it simply bounced in the dirt and stuck to the front facing of Molina's equipment, leaving Molina—who was unaware of the ball's whereabouts—to feverishly look for the ball before finally finding it affixed to his person. Case Play Question: Notwithstanding the physics anomaly (let's assume the ball's legal rosin and pine tar levels allowed for the glue-like effect), what is the proper ruling for such a play? 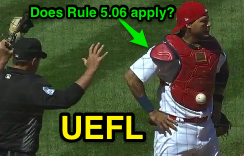 With runner(s) on (let's assume a runner on first base, running on the pitch, made it to third base before Molina found the ball), what is the proper ruling? Answer: The stuck ball remains live. This is not a "lodge," pursuant to Rule 5.06(c)(7): the ball is readily accessible to Molina, who does not attempt to retrieve it. Thus, the ball is live and in play. OBR 5.06(b)(4)(I): "If the batter becomes a runner on a wild pitch which entitles the runners to advance one base, the batter-runner shall be entitled to first base only." their bases, without liability to be put out, when—A pitched ball lodges in the umpire’s or catcher’s mask or paraphernalia, and remains out of play, runners advance one base."